Led astray by the lure of wild powerbands and wilder tank-slappers we present: KR-1S, RGV250M, TZR250 and, just for old time's sake, RD350LC-F. We trundled them across the fens, hurled them up the Cat and Fiddle road (the A53 between Buxton and Mace), sat them in a traffic jam in Manchester and finally whupped them round the ultra-tight Three Sisters race track near Wigan. We even brought most of them back again. Well, actually, they would've let it lie, but we wouldn't listen. 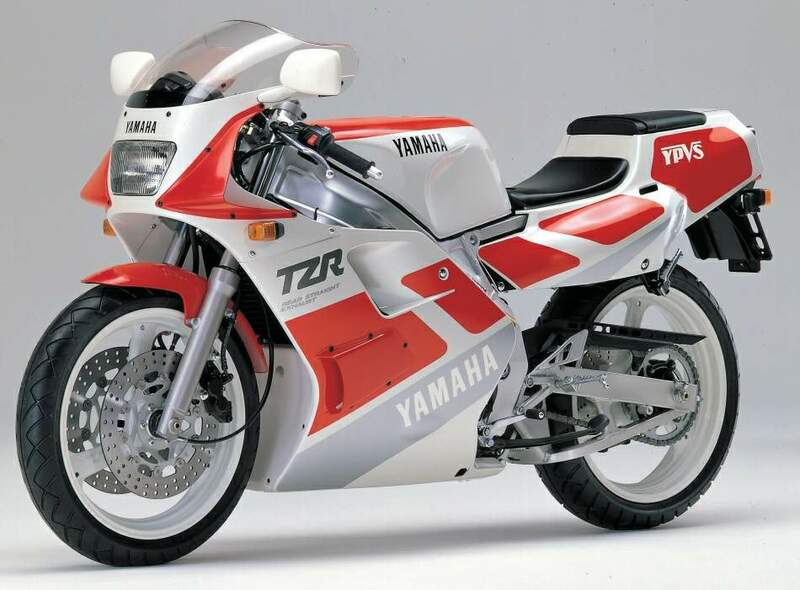 The TZR is now out of production, and Yamaha aren't keen to push the remaining stocks. They would rather let them slip quietly away without any fuss that might detract from the almost certain 1992 launch of the all-new TZR. 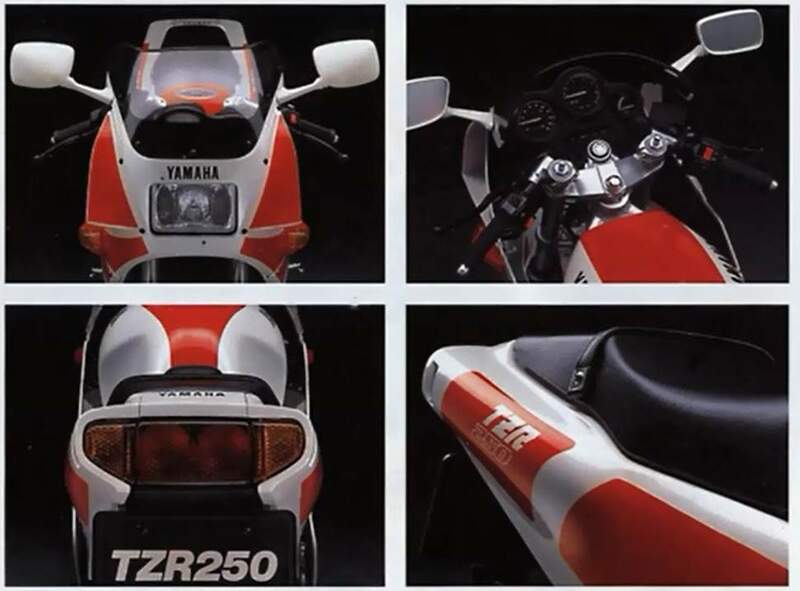 It's a shame really, because there is life in the TZR yet as road bike. It may no longer be able to cut it on the track, but the combination of stable handling and reliable power means it can still keep up on all but the fastest roads. Where the RGV would sit up violently under mid corner braking, and the KR-1S felt as though the front wheel would tuck under, the TZR stayed gently on line until the rider decided what to do next. This is the sort of behaviour that can save your bacon on unfamiliar roads, especially when they are flanked by frightening drops. On paper at least, the TZR is the slowest steering of the 250s, sharing its rake and trail figures with the 350 powervalve, and it may be this which helps give straight line stability that's no more than a dream for KR-1S owners. Cresting small rises on the Cat and Fiddle, or launching off yet another cratered bump on my ride across the fens to work, the TZR would lift its front wheel slightly, give just a little wibble, then smack rather satisfyingly back down to earth before continuing on its way as though nothing had happened. On the same fen roads, the KR-1S would go from lock to lock before settling down, and meeting another bump before the steering had sorted itself out was a deeply distressing experience. At Three Sistefs the TZR's tyres quickly became the limiting factor. Yamaha aren't doing themselves, or the bike, any favours by letting it out of the factory with tyres so far behind the rest of the bike. Trevor: 'The standard tyres are disgusting.' This was something we all agreed on, although Rupert was more polite: 'The tyres grip OK but offer nothing like the feel and grip of the RGV/KR-1S. Aftermarket stickies would improve things but it'll never quite be up to the latest standard. It'd be enough for most people though.' By all accounts a change to Avon AM22/23 rubber does the job nicely. 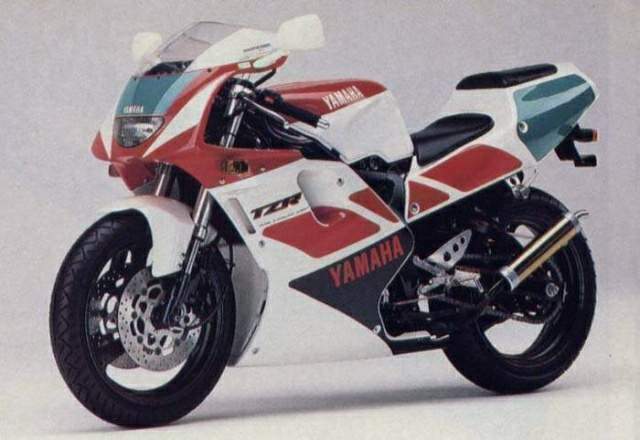 Stepping onto the TZR directly after the RGV, it's easy to see the Yamaha as crude and unsophisticated, but the fact is that the basic package is so good it doesn't need frills. Stephen, commenting on the suspension options, pointed out: 'There's not much adjustment because it's not needed.' The best thing to do with a TZR is to set the rear preload to suit your own bulk, then get on with riding it. Ten minutes in town and the TZR shows the other side of its character. Apart from some mild clucking between 5 and 6,000 revs, when the powervalve can't decide whether to open or close, the motor is utterly docile in traffic. It puts up with extended low-speed running without complaint, all the controls and switchgear are sensibly designed and easy to use, and the well-shaped seat and relatively upright position make it easy to trickle through jams where the Kawasaki and Suzuki produce a wrist-heavy weave. Trevor summed up the joys of long-term TZR ownership: 'More friendly than the others. Starts first time, the mirrors are useable and the seat is comfortable up to the first tank refill' If that doesn't sound very far, bear in mind that the other 250s were probably designed by an unemployed set designer from a Japanese TV game show specialising in personal humiliation. Stephen added: 'The TZR is easy to clean, good pillion seat, luggage can be carried, lasts for ages. Bought by sensible people.' Except for you, Stephen. If all this seems to be singing the TZR's praises rather too loudly, then I apologise, but Trevor was its loudest critic, and the worst comments he could make were to suggest that it was under-geared (hitting peak revs long before the timing lights at Bruntingthorpe), and to point out a grabby clutch. The TZR is dead. I wonder if the new one will live as long. But they're going to just the same. Like the TZR, the good old powervalve is being pensioned off. Muted by noise restrictions, choked by emission controls and rendered obsolete by ever newer and faster models, the 350 has come to the end of its eight year run. Rather the oddball in our test, the 350 was invited along to give us something to ride when the others got too uncomfortable, and to allow Rupert to exercise his well known concern for endangered species of all kinds. Rupert loves this bike: 'I love this bike,' he said. See? The 350 arrived with a half worn OE front tyre, and a similarly dogeared Metzeler ME99 rear. Rupert: 'Felt awful and yawed into comers. Front/rear mismatch bad news. Dodgy in the wet' The first port of call, therefore, was to kneel at the shrine of Steve Lythgoe at Sharples (0204 54698). Steve, fount of all knowledge on things black and sticky, recommended Pirelli Demons but didn't have a front one in stock. A few phone calls and the Manchester Pirelli distributors had some on the doorstep within a couple of hours. Thank you Ivan. I was particularly grateful for the comfy seat on the run back from Three Sisters a few hours after my unscheduled track inspection. There was no way I could sit on any of the 250s - even the TZR - but the 350 was comfortable enough to allow me to keep up with the others without aggravating my bashed left arm and shoulder. For me, the best thing about the 350 is the way it lets the rider know when it's time to back off. The Kawasaki and Suzuki walk a very fine line between fine handling and unmanageability - you either get it right or very, very wrong. The 350 reaches a sort of plateau area just before it reaches its real limits. It's possible to go a fair bit faster if you up your concentration levels; it's equally possible to bumble along and let the bike do the work, confident that it'll forgive you for the odd unconventional line or unexpected emergency stop. The motor in our bike had been seized and completely rebuilt just before we borrowed it, and was running rather woolly. Rupert tells it like it is: ' Warms slow, spews on choke. Lots of clatter on overrun at mid revs made worse by worn shock absorbers in clutch basket. Bit more of a noticeable power step than others. Never feels crisp and agonisingly beautiful like the KR-1S. Pulls good wheelies off the throttle. Power valve opens/shuts at 5,500rpm — engine hunts and clucks like a Norton Fl. Transmission backlash makes this worse. Dies at 9,400rpm. Ledar pipes increase rev range. Will go faster with higher gearing, but lower is better — the motor is in the real road speed range then.' Thank you. Now, where were we? Ah, yes. It was no surprise that the RD was the easiest to get on with in town. Even running rich it was still possible to stay at low revs. The milder tuning and extra 100cc makes for better roll-ons than the 250s, too. The RD is a relatively cheap, freely available way to get to work all week, get your knee down at the weekend and take on holiday in the summer. Direct comparisons are meaningless. This is one of those rare bikes that is, quite literally, in a class of its own. It was a matter of honour, I suppose, that Suzuki should try to follow up their return to Grand Prix with a similarly impressive return to the streets and roundabouts where those races are re-run every Saturday night. Unfortunately for them the old RGV didn't really make an impression on the track (in the UK - it did in France - RP), and when it came to laying down the deposit for a road-going 250, the RGV's styling wasn't seductive enough to get over being a few horsepower down on the KR-1S. The power shortfall is still there, so perhaps with the M, Suzuki are trying to win sales through sheer novelty value - the first 250 with upside-down forks, banana swing arm and both exhausts exiting on the same side. If you can't wrestle with the bars, you've always got body weight. The RGV responds to pressure on the footrests more precisely than most bikes do to commands from the bars. ' Weight pushed onto the foot-rests will give the required angle of lean. The bars are there to give stability.' - Trevor. On bumpy fen roads, the RGV produced the most frightening tank-slappers I have ever had the misfortune to experience. The bars weren't wrenched from lock to lock as violently as on the Kawasaki, but they took longer to settle down - time that you don't always have when you're headed for the dyke and the coypu are hungry. It's strange, but the RGV only behaved like this in a straight line. On my way home from work there is a long, left-hand bend. On its apex is the scar of a long-forgotten roadwork, running from one side of the road to the other and sitting proud of the surface. Hitting this cranked over the Kawasaki kicked its front wheel towards right lock, and threatened worse, before coming back on course. On the same bend, at similar speed, the RGV hit the bump, bounced, but continued on line. Elsewhere on the road, the RGV would sit up under braking, a tendency that went from mild to awful depending on suspension settings. As a rule, the nearer we got to curing it, the worse the suspension behaved the rest of the time. In the end, it's something you have to learn to live with. Stephen suggested that, if you really need to scrub off speed in a corner, then you should use your knee. Once the bike's moving, other irritating traits make themselves known. The Suzuki's gearbox is not up to the standard of the rest of the bike - the first three gears clunk like a car door, though after that it's as slick as you could wish. When the oil light glows you discover the oil filler can only be reached with a funnel (and how many paddock jackets have room for a funnel these days?). Our bike usually ended up with overspill dripping onto the rear tyre. The pillion seat is a sick joke. The kickstart lever vibrates outwards whilst on the move, then catches your leg when you try to put a foot down to stop. The motor is in a very high state of tune straight from the factory - peak power and torque are in the same place, and Stephen felt this was bad news for long term ownership: 'It'll wear out very quick — the engine's got the nuts tuned off it.' This translates into a very peaky feel - the motor won't always pull 70mph in top, but brilliant carburation helps to make it useable out of the powerband, so long as you don't expect any real acceleration. It's as if, when it's not at peak power, the motor is just marking time. The only problem was on the overrun: 'Excellent carburation from tickover to 12,000rpm, except rolling off slightly at high revs, eg: passing a car and pulling in. The motor stutters and clacks quite violently - you have to shut off or accelerate. It would be nice if it was crisp and clean at this point.' - Rupert. Public roads can never give a true indication of the RGV's capabilities. This is a bike designed to be ridden on smooth, twisty tarmac with nothing coming the other way. Once you know which way the track turns the RGV will take get you round quicker than you thought possible. It is capable of taking you to astounding lean angles and it can stop as fast as you dare. It is not, however, an easy bike to ride fast. It will respond to precise and knowledgeable control by taking you to a smooth, fast lap. It will respond to nervous input by spitting you off. The RGV is at a stage of development where there is no room for anything other than perfection. You sometimes feel as though you've reached the RGV's limits, but the limits are your own. Rupert: 'At 80-110mph it just glides along like a low flying aircraft. Superb poise - change the angle of lean and it'll immediately assume the new set, a bit like when a hairdresser moves your head to a different position. The front feels mega pushable. Astounding grip at crazy angles - I've never seen anyone lean over so far on road tyres as Stephen at Three Sisters.' Those marvellous tyres, though, pay for their superb grip by wearing out and spitting off bits of rubber onto the bellypan as rapidly as anything with NOT FOR HIGHWAY USE on the sidewall. One second I was following Stephen out of the hairpin and into the downhill left hander, the next I was sliding along on my back. The front had gone so quickly it wasn't until I'd ground to a halt that I realised what had happened. The forks seem to have too little compression damping and too much rebound - under braking they dive straight to full compression and then stay there, chattering over bumps so that it's impossible to use all the incredible power of the front brake. 'Like trying to dig up concrete with a garden fork,' was how Trevor put it. Stephen plans to try longer, softer springs and slightly more oil, but of a lighter grade, on his own KR-1S. The rear suspension is fine for going fast, though the shock tends to top out on the standard rebound settings - going up to position two cures that, any more and it begins to chatter. The other factor preventing full use of the brakes is the seating position, which is the worst of the 250s. 'Jump on a desk and kneel on it, then put your clenched fists flat on the desk face down. Then look up. That's a KR-1S riding position.' - Rupert. Like the RGV, the low bars are too far away for the rider to steer as effectively as possible, or to brace himself against the brakes. The Kawasaki has one of the most powerful brakes currently available on a motorcycle, but you can stop quicker on the RGV because it's easier to control. These criticisms are only in relation to the RGV's excellence. Ridden on its own the KR-1S seems like the most responsive bike in the world. In the real world genuine excellence matters less to most people than perceived performance. Marginally out-handled and comprehensively out-posed by the RGV, the KR-1S will have to make the most of its power advantage if it is to maintain sales. On the dyno, the perfectly set up RGV gave a max of 53.7hp. The Kawasaki pushed out 55.5, but Ledar's Colin Taylor reckoned it was over-oiling and running rich, and that there were several more horses to be gained by careful setting up. Once in the power the KR-1S pulls up to 136mph, stomping on the RGV by nearly 10mph. This has more to do with gearing than with the small power difference, but higher gearing would lose the RGV the small advantage it has away from the line. Urban riding is not the Kawasaki's strong point, but it is no worse than the RGV. Manhole covers and potholes throw you against the tank, even at low speed. This puts even more weight on your already overloaded wrists, and the quick steering which is such a joy at the track wanders around like steering through treacle. The bike doesn't start working until it reaches the sort of speeds which leave your licence extremely vulnerable. Trevor found the motor absolutely useless below 3,000rpm, but tractable enough between there and 7,500, after which: ' Warp drive that James T Kirk would kill for. And the gears are as precise as climbing stairs.' The only problem with the gearbox is an occasional need to hunt around for neutral - annoying at lights, but as most people sit in gear and rev the engine they won't notice. On the forecourt, filling up with two stroke is easier than on the RGV, but entails taking off the pillion seat, getting to the toolkit, then unbolting the main seat to access the tank. The best smelling oil for the KR-1S is Silkolene Pro-2, by the way. If I wanted to get really picky I could say that the indicator switch is too fiddly for a gloved thumb, the mirrors reflect your elbows, the lights are too diffused to offer serious illumination and it hurts when you fall off. But these things are of no relevance to anyone who wants one of these bikes. Like the RGV, the KR's a racer with lights. It'll be bought on the back of track success and fashion credentials and bugger everything else.